THE average woman spends around £70,000 on her appearance during a lifetime, a survey found. The new research also claims nearly £34,000 of this is spent on her face alone. In a bid to stay looking young, nearly a quarter of women said they would consider cosmetic surgery and one in five women admit to spending up to £19.99 a month on anti-ageing facial products. In a bid to encourage a healthy lifestyle and help combat the strains of using modern technology, Groupon has teamed up with face yoga expert Danielle Collins to create a unique and brand new fitness workout for the face. A Groupon spokesman said: “We’re always on the lookout for new trends and facial fitness is definitely something more people are becoming interested in. That’s Groupon, the discount website, who just might have discounts available for their new style of yoga, just maybe. This entry was posted in Uncategorized and tagged Express, groupon, john chapman on March 22, 2017 by Michael Marshall. It’s traditionally a time for abstinence and experts say Lent will not only give your willpower a boost but your wallet too. Money-saving specialists claim you can save hundreds of pounds this Lent by ditching your vices including coffee, chocolate and ice cream. In fact quitting so-called ‘addictive’ products such as sweets, pizza and even smartphone purchases could help you make a total saving of almost £1,000 – enough to buy a coveted Mulberry Bayswater tote. That’s according to the money saving team at PromotionalCodes.org.uk who have calculated how much money we could save we they successfully ditch our cravings for 40 days and 40 nights. Darren Williams from Promotionalcodes.org.uk said: ‘Usually Lent is about sacrificing something that you love, and often people tend to give up products that are unhealthy for them. 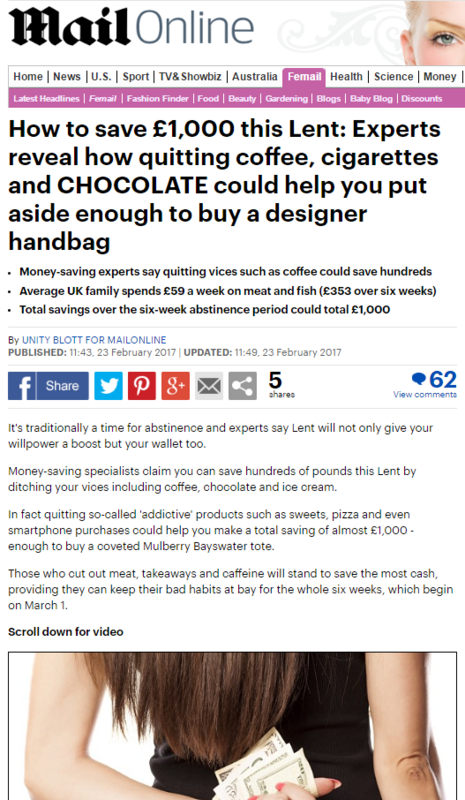 ‘However, there could also be serious benefits to your wallet as well as your health when it comes to cutting out your cravings for Lent. ‘Britain has a major binge culture, and if people are able to cut out just one of the products that they love to indulge in the savings could be enormous. Forget demonstrating your fealty to Jesus Christ, with these voucher-led savings who can afford not to Lent? Right, Promotionalcodes? 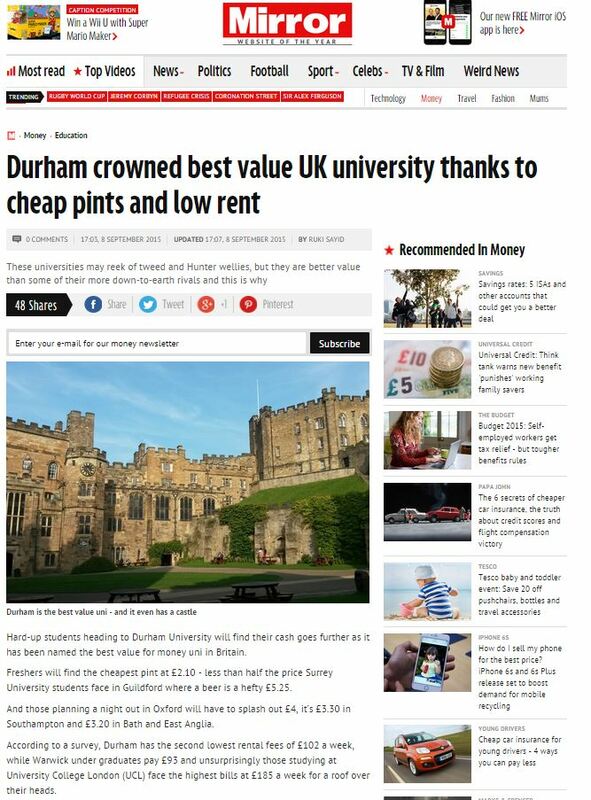 This entry was posted in Uncategorized and tagged daily mail, Darren Williams, promotionalcodes, Unity Blott on March 17, 2017 by Michael Marshall. It’s long been claimed that opposites attract but experts have found that may not be the case after all. After looking at a number of different physical and personality traits across more than one million of its members, the experts at Match.com have found that singles are overwhelmingly more likely to hit it off with someone similar to themselves. Dating advice in the Daily Mail here, courtesy of a dating website who wants to advertise that they exist and want to highlight the fact that they like to promote themselves as experts in dating science – Match.com. This entry was posted in Uncategorized and tagged bianca london, daily mail, Match.com on November 26, 2016 by Michael Marshall. THE COLD and flu virus is rife with various strains being spread across the nation, causing coughs, sore throats and even the dreaded norovirus. The number of people getting in with the viruses is higher in winter, and the bad weather can even exacerbate existing health conditions. Sickness statistics revealed by Dettol’s survey of 2,000 people, found 30 per cent admitted that they called in sick more than once this year alone due to a cold. 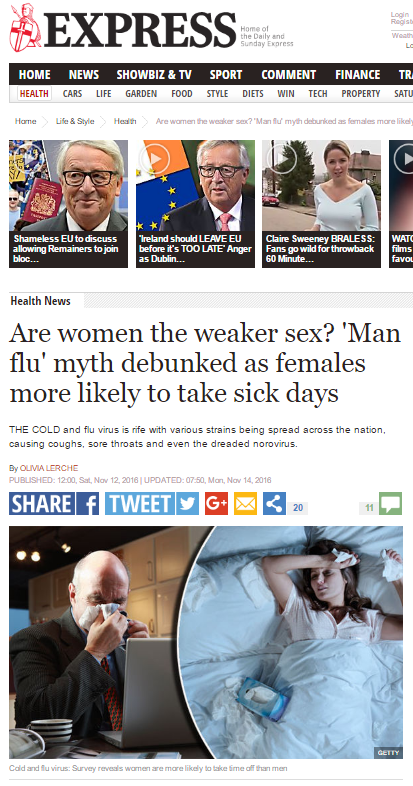 Of course, had the stats worked out as showing that men took slightly more sick days than women, Dettol could run a very similar article, gaining just as much column inches, regardless of the outcome of their survey. This entry was posted in Uncategorized and tagged Dettol, Express, Lisa Ackerley, Olivia Lerche on November 25, 2016 by Michael Marshall. They say little girls are made of sugar and spice but it seems they are also made of money – and lots of it. It has emerged that girls cost a staggering £30,000 – more than the average UK annual salary – to raise than boys. Experts found the cost of raising a child from birth until the age of 18 came to £79,176 for a boy and £108,884 for a girl – a difference of £29,708. Real research? 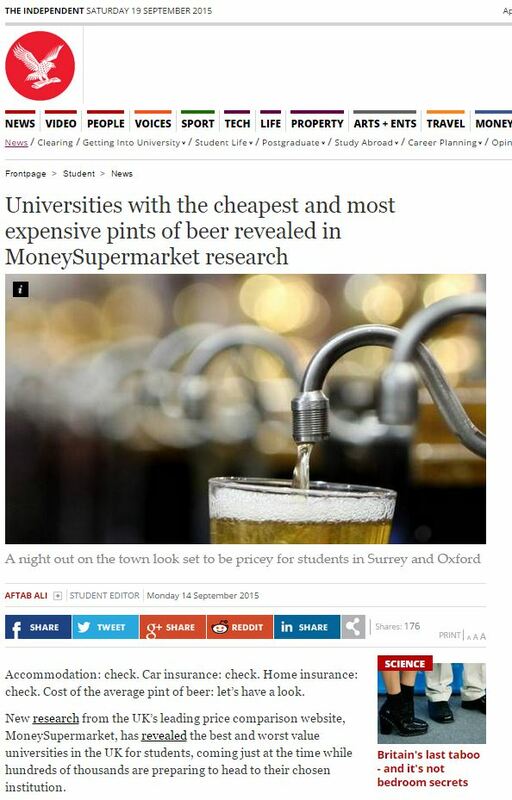 Or just a reason to mention a price comparison website in the press? The study, by MoneySuperMarket.com, found it was girls’ clothes, toiletries and makeup that weighed most heavily on their parents’ wallets. 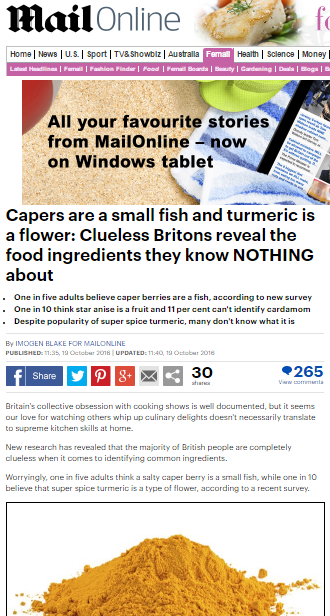 This entry was posted in Uncategorized and tagged daily mail, MoneySupermarket, Unity Blott on November 22, 2016 by Michael Marshall. Bankers and brokers are the most likely to stray and cheat on their partners, an eye-opening survey has revealed. Those in the financial sector are most prone to betraying their loved one, followed closely by pilots and doctors and nurses. Research also showed that two out of three adulterous women (65 per cent) say they strike up affairs with people from the office – as they suggest it makes work more exciting and fun. 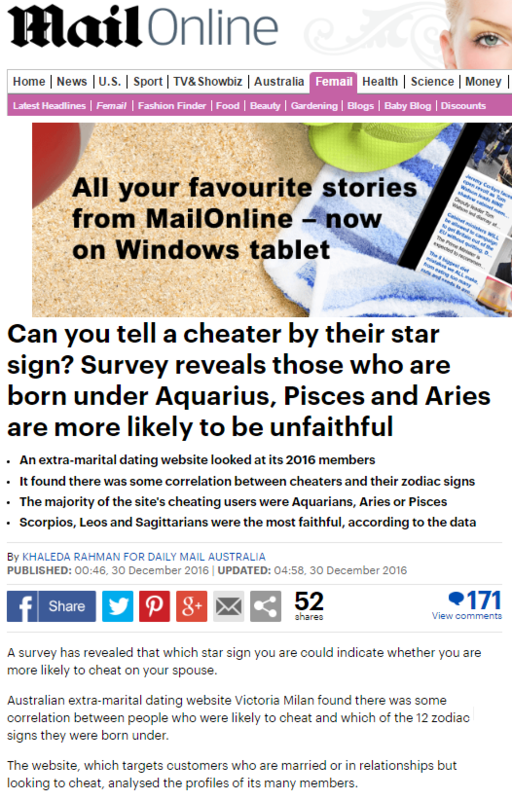 The survey was taken of 5,658 cheating women, and conducted by Victoria Milan, a website for married and attached people looking to have affairs. Everyone is having affairs, so it’s totally normal and you should consider it. It’s actually superficially surprising to see the Mail take the line that it’s the women who are responsible for having affairs – so surprising, in fact, that the Mail’s picture desk doesn’t appear to have gotten the memo, and runs the story with plenty of photos of adulterous and untrustworthy men, contrary to the angle of the article. Sigurd Vedal, founder and chief executive of Victoria Milan, said the survey showed that people are more into having a great time and enjoying life than advancing their careers. ‘The survey clearly shows that even though there’s a risk to your career, having an affair at work makes life a lot more pleasant. It may be the most subtle the owner of a website which sells itself on the Ashley Madison business model could ever be accused of being. This entry was posted in Uncategorized and tagged daily mail, Ekin Karasin, Sigurd Vedal, victoria milan on October 30, 2016 by Michael Marshall. BRITAIN’S roads are crumbling so badly that drivers make a claim for pothole damage every 17 minutes, the RAC Foundation revealed yesterday. In the last financial year drivers made at least 31,483 claims against councils for vehicle damage caused by poor road conditions. The total was 9 per cent up on the previous year, said the analysis of data from 204 out of Great Britain’s 207 local authorities. Motorists claimed for damage including punctures, wrecked wheels and broken axles. Motorists whose cars are being damaged by potholes on Britain’s ‘crumbling third world roads’ are making a compensation claim to councils every 17 minutes, a damning new report reveals today. But while the number of claims made has risen by nearly 9 per cent, the money that cash-strapped councils are paying out to hard-pressed motorists is actually falling, leaving drivers out of pocket, according to the respected RAC Foundation. It says that last year drivers made at least 31,483 claims against councils across Britain for potentially ‘life-threatening’ vehicle damage – equivalent to one every 17 minutes. RAC Foundation director Steve Gooding said: ‘These figures are symptomatic of the inadequate funding available for local road maintenance. ‘Drivers worried about the cost of running a car scarcely know where to look. 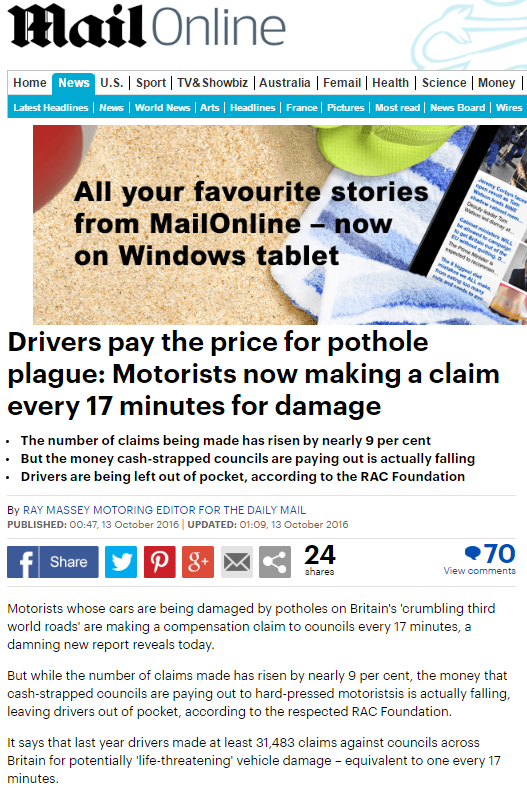 They must try to keep one eye on rising pump prices and another on the potholes that can add hundreds to their annual motoring bills by causing damage to tyres and wheels. I’m sure the RAC have drivers’ best interests at heart in highlighting the damage that can be done by pot-holed roads, but they also won’t be too disappointed if the reminder prompts drivers to ensure they have breakdown cover, should the worst happen. This entry was posted in Uncategorized and tagged daily mail, Express, john ingham, rac, ray massey, Steve Gooding on October 29, 2016 by Michael Marshall.